Adds 124 brand new enchantments to the game, accessible through thousands of new enchanted items that are integrated seamlessly into loot lists and vendor inventories. - Link Attributes: reduced base value from 10% -> 6%. 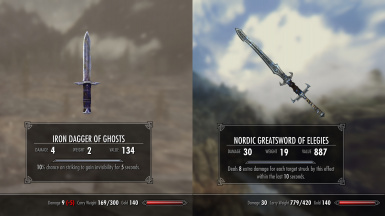 - Reduced the power of unique enchantments (Berserker, Enhanced Healing, etc). - Added Drain Magic Resist. - Enfeeble: now implemented without scripting and correctly affected by magic resistance; effectiveness reduced from 50% -> 30%. - Frost Damage Piercing: fixed description. The most important one line changelog you'll ever see, short of Myth II v1.1. - Soul Charge: no longer erroneously fills the smallest gem first; now works on NPCs. - Double Turning: now only affects spells, fixing a bug where any enchantment combined with a Turn Undead enchantment would be twice as effective. - Exemplar: fixed a race condition that caused part of the effect to get stuck. - Leprosy: fixed a race condition that caused part of the effect to get stuck. This is a minor patch, but 4.00 is a major patch that may require some preparation if you're coming from 3.02. Scroll down for update instructions. - Drain Armor: now actually disenchants into the base enchantment instead of itself (no more 6 copies). - Fortify Attributes: now a Value Modifier instead of Peak Value Modifier. - Items "of Obliteration" (PowerAttack05) are now spelled correctly. - Items "of the Spell Mire" (SpellEater03) are now spelled correctly. - Articulation: now gives Speech skill instead of SpeechPowerMod to match the USKP fix to this enchantment. - Fortify Health: Now correctly spelled as Health. - Fortify Persuasion: Fixed description. - Fortify Stamina: Now correctly spelled as Stamina. 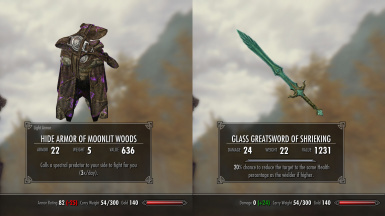 - Elf Slayer (Blade of Ysgramor): no longer heals elves instead, added animation, added description, added keyword. - Deleted Keening changes and modified enchantment stats to match the USKP fix to this item. - Wintermyst no longer modifies AlchDamageSpeed, dunSleepingTreeSlowAlch or FrostSlow effects. --- Blood of the Aldmeri -> Extend Alchemy, Intuitive Magic, Scroll Mastery, Steadfast Magic. --- Blood of the Nedes -> Berserker, Enchantment Mastery, Silvermyst, Evermyst. --- Channeling -> Double Healing, Double Runes, Double Turning. --- Desperate -> Lucky Health, Lucky Magicka, Lucky Stamina. 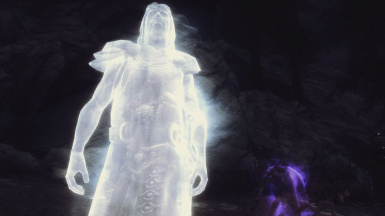 --- Fortify Attribute during Weather -> Fortify Sneak Attacks, Battle Momentum, Aedric Blessing. --- Fortify Mounted Combat -> Fortify Mounted Combat, First Blood. --- Fortify Sprint -> Fortify Combat Speed, Marathon. --- Maze -> Block Disarm. 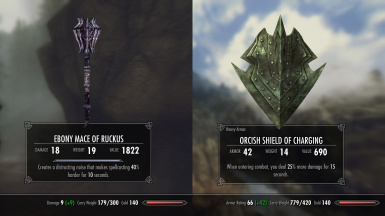 --- Necromancer's Moon -> Sequester Magicka, Sorcerous Health, Sorcerous Stamina. 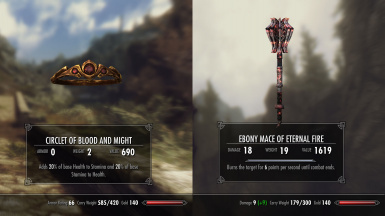 - The creatures spawned by summoning enchantments now regenerate 5 points of Health per second (since reequipping the item respawns them with the same Health they had when unequipped, you could end up with ones that were guaranteed to die in one hit no matter what) and can no longer be activated. - Blink Step: now accomodates gamepads (only if Activate and movement controls are both mapped to the gamepad). - Cheat Death: now halves damage taken below a certain Health threshold, but cost greatly increased, increased magnitude from 5 -> 3, disabled on NPCs (it never worked on NPCs, but actually added its magnitude to your Cheat Death magnitude!). If you were using items with Cheat Death, unequip them and type "set SCC_Ench_Restoration_Global_CheatDeath to 0" into the console). - Cure Disease: improved description. - Deep Breath: now correctly only triggers when you use a shout instead of any spell, added delay for Ordinator compatibility, improved description. - Fortify Power Attack: now applies regardless of whether or not the target is blocking, but increased cost. - Fortify Swim Speed: improved script. 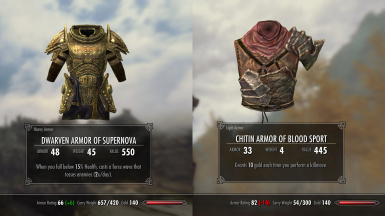 - Hardening Armor: script no longer piles up while the menu is open, improved description. - Healing Cloak: reduced tick rate to reduce condition load. - Link Attributes: now refreshes itself after a level-up. - Nova: increased Health threshold from 10% -> 15%. - Phantoms of the Wild: script no longer remains active when uninstalling the mod, improved description. - Powerbond: reduced tick rate to reduce condition load, increased bonus from 60 -> 75 points. - Shalidor's Shield: reduced duration from 5 to 4 seconds to reduce script load. - Smoke and Mirrors: now has a delay so it doesn't interrupt itself easily. - Spurs: reduced tick rate to reduce condition load. --- Mug -> Clumsy: grants a chance to make the target drop a random item each second for X seconds. --- Absorb Carry Weight -> Absorb Critical Chance. - Renamed Harmonic Pain -> Resonance. - Renamed Overbearing Strike -> Overbearing. - Disease Damage: increased from 3 -> 4 damage, now gains both damage and duration with power. - Drain Skills: fixed description. - Enfeeble: now capped at -75% target damage. - Exemplar: reduced duration of enchantable version to avoid issues when leaving combat. - Killstreak: fixed race condition, bonus damage is now also over 1 second. - Leprosy: reduced duration of enchantable version to avoid issues when leaving combat. - Poison Damage: increased from 3 -> 4 damage, now gains both damage and duration with power. - Pushback: improved script, no longer triggers a spellcast event. - Quicken Shouts: shortened description. - Resonance: increased damage from 6 per stack -> 7 per stack. - Riposte is now a Destruction -> Alteration effect, now staggers the target for a variable amount based on enchantment power. - Steal Weapons: improved script. - Reduced brightness of RestorationSun shader. - Fortify Health during [Weather]: Now correctly tagged as enchanting instead of alchemy. - Fortify Sprint: Slightly sped up script execution speed. Now uses the same enchantment for dropped and crafted versions. Fixed erroneously high cost for crafted version. - Fortify Swim Speed: Slightly sped up script execution speed. 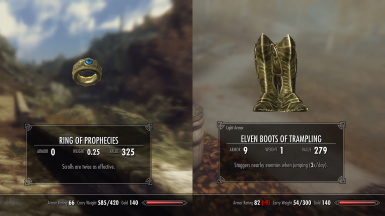 Now uses the same enchantment for dropped and crafted versions. Fixed erroneously high cost for crafted version. 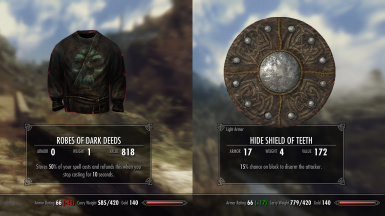 - Hardening Armor: Now wears off faster after leaving combat. If you are using the Skyproc Patcher, make sure you have the latest patcher to go with the latest mod version. If not, there is a risk of a boxing glove coming out of your screen and punching you in the face. - Replaced Drain Resistance with Leprosy. - Cull the Herd: Now correctly modifies damage BY the bonus amount instead of TO the bonus amount. - Affix: Renamed Vulnerability to Infection. - Affix: Renamed Exposure to Contagion. 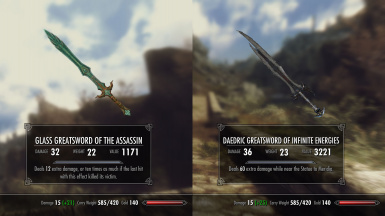 - Fortify One-Handed now correctly improves dagger damage. - Because the internal name of Ench_CullTheHerd was changed (from Ench_Execute), enchanting.xls was updated accordingly. - Updated enchanting.xls and languages.xls to include the change from Ench_DrainResistance to Ench_Leprosy.
! 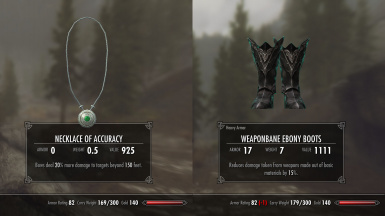 Unequip and reequip Tremor items ("Staggers nearby enemies when jumping"). - Replaced Execute -> Cull the Herd: 10-20% bonus damage vs enemies that are not alone. - Blink Step: Improved responsiveness when blinking forwards. Improved description. Improved teleport responsiveness and reduces error when turning around rapidly. - Cheat Death: Now protects against hits below 15% health instead of just killing hits (which was unreliable). Increased cost. Fixed race condition that could cause it to fail. Improved description. - Fire Damage Lingering: Now removed when either the target or the caster leaves combat instead of just the target. - Killstreak: No longer deals erratic damage when the killstreak doesn't trigger. Fixed race condition that could cause kills to fail to register. Added blood splatter effect to indicate the bonus damage. - Tremor: The shockwave now only triggers in combat to prevent wasting it. Improved script execution speed. Improved description. - Updated "restoration necro" inventory model to match Apocalypse. - Deep Breath and Mug no longer have a non-scaling value highlighted. - Updated enchantments.xls to accomodate new Cull the Herd enchantment. 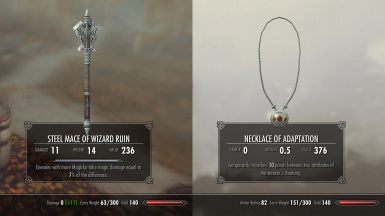 - Fixed Extend Conjuration & Magicka Regen giving reduced Magicka cost instead. 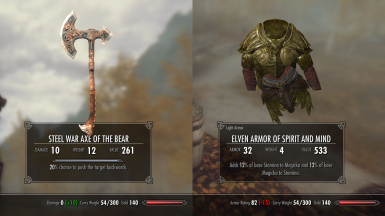 - Improved the damage of weapons with non-elemental damage enchantments. - Improved the base magnitude of non-elemental damage enchantments. - Improved the base magnitude of some percentage chance enchantments. - Fixed a typo in a vanilla enchantment ("Fortify Restoration & Magica Regen"). - Blink Step: Player created version has a base magnitude of 7, up from 5. - Fortify Swim Speed: Player created version no longer erroneously has a full body effectshader. - Warrior Rend: Player created version has a base magnitude of 6, up from 5. - Wizard Rend: Player created version has a base magnitude of 6, up from 5. - Fixed incorrect file date that could result in issues with third party mod managers. - Phantoms of the Wild: Summoned Phantom Wolf can now open doors. - Briarheart Geis: Enchantment improved from 5 to 15 points. 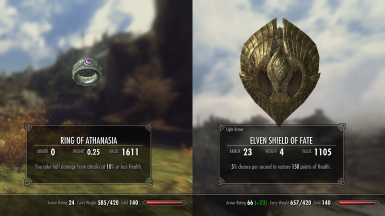 - Fortify Stamina Rate: Fixed enchantment still being affected by Restoration. - Reverted most vanilla enchantments to the SkyRe version. Bulwark, Channeling, Fortify Mounted Combat, Fortify Sprint, Fortify Swim Speed, Gladiator's Glory, Hardened Armor, Mage Ward. Beaconbound, Bountiful Hunt, Counterspell, Mug, Overbearing Strike, Riposte, Silent Moons Enchant, Sunlight. - Overbearing Strike: Changed threshold to "full health" from "90% health". Bulwark, Channeling, Desperate Regeneration, Fortify Long Range, Fortify Mounted Combat, Fortify Power Attack, Fortify Sprint, Fortify Swim Speed, Gladiator's Glory, Hardening Armor, King of the Lost, Mage Ward, Optimize Attributes. Blood of the Aldmer, Blood of the Nedes, Fortify Attribute during Weather, Necromancer's Moon. Blink Step, Enchanter's Touch, Execute, Explorer, Fence, Fortify Long Range, Fortify Power Attack, King of the Lost, Optimize Attributes, Perception, Phantoms of the Wild, Tremor. - Cure Disease: No longer stops working after one round of curing. - Deep Breath: No longer erroneously adds a bonus to LastFlattered. - Desperate Regeneration: Now grants a % chance to burst regen instead of slowly regening. - Fortify Mounted Combat: Now grants damage reduction instead of bonus armor. - Gladiator's Glory: No longer erroneously gives gold when equipped. - Hardening Armor: Now ticks every 5 seconds instead of every 6 seconds. - Optimize Attributes: No longer lets you configure the enemy's attributes if their items were just so. - The mod is now available for users without DLC! - Added missing 2H Draugr cold weapons. - Fixed some items "of Mountaineering" being assigned to the wrong levelled lists. - Fixed missing items "of the Assassin". 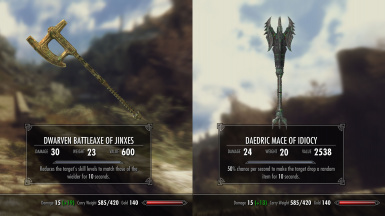 - Fixed missing Daedric Maces and Daedric Battleaxes "of Illusory Ballast". - Fixed missing non-Dwarven crossbows. - Killstreak: Changed functionality to improve reliability. - Shock Damage Percentage: Reduced base percentage from 7% to 4%. Bored with the vanilla pool of just 34 enchantments? Wintermyst adds 124 brand new enchantments to the game, accessible through thousands of new enchanted items that are integrated seamlessly into loot lists and inventories. It also fixes many bugs related to vanilla enchantments. 2017-01-06: Wintermyst is no longer in active development and is superseded by Summermyst - Enchantments of Skyrim available for classic Skyrim and SSE. Wintermyst will remain available for historical purposes. 124 unique new enchantments: 77 armor enchantments and 47 weapon enchantments. 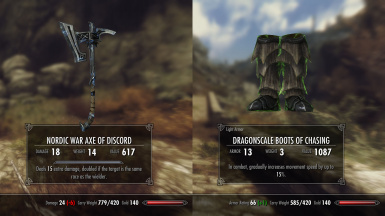 Thousands of new enchanted items added to the game's loot lists, NPCs and vendor inventories. All of the new enchantments can be disenchanted. 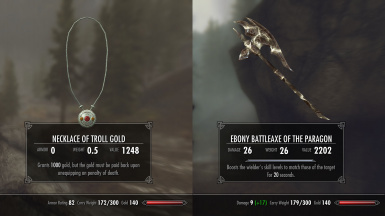 Many bugfixes to vanilla enchantments. Configuration options available in the Wintermyst MCM if SkyUI is installed (SkyUI not required to use Wintermyst). 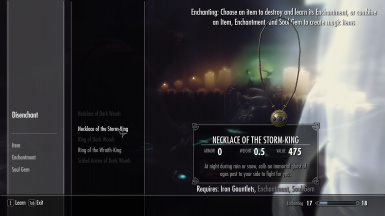 Enchantment descriptions can be found in the Readme. Wintermyst fixes many bugs with vanilla enchantments. See the Readme for a list of changes. ASIS: Compatible. ASIS Increased Spawns will incorrectly affect ally summoning enchantments unless you follow these instructions. 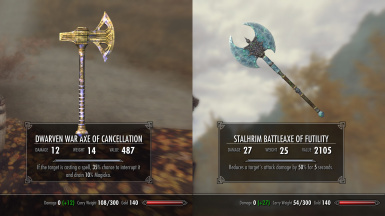 Animated Weapon Enchants: Redundant. This feature is already in Wintermyst. Enchanting Awakened: Not compatible. Due to the completely different way enchantments work in Enchanting Awakened, it is not compatible with Wintermyst. Both mods can be active at the same time, but the enchantment limits in Enchanting Awakened do not apply to Wintermyst enchantments. 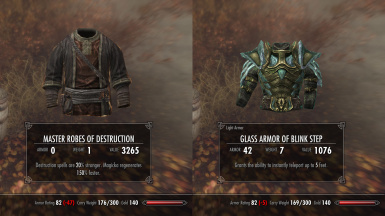 Immersive Armors: Compatible. 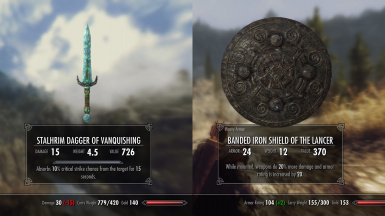 You do not need a bashed patch because Immersive Armor does not modify levelled lists but adds its items at runtime using a script. Immersive Weapons: Modifies levelled lists; make a bashed patch to merge both mods. Loot and Degradation: Third party compatibility patch available on the Loot and Degradation page (classic). Ordinator - Perks of Skyrim: Compatible. Perkus Maximus (PerMa): PerMa includes a modified version of Wintermyst and updates for this version can be found on the PerMa page (classic). Requiem: Third party compatibility patch available here. 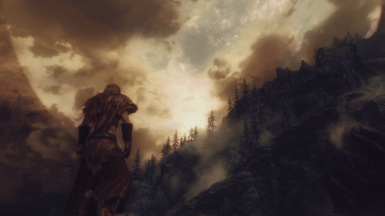 Skyrim Redone (SkyRe): Compatibility patch available on the downloads page. The patch does not include SkyRe-specific items with Wintermyst enchantments; make a bashed patch to merge their respective loot lists (levelled items), then use the Wintermyst Skyproc Patcher to generate item variants with Wintermyst Enchantments, then run the SkyRe Reproccer on Wintermyst to bring the stats of its added items in line with SkyRe. Summermyst - Enchantments of Skyrim: Incompatible. Both mods modify the same content. Pick one or the other. The Unofficial Skyrim Patch (USKP): Compatible. Worlds Dawn: Compatible. Requires version 1.04 or later of Worlds Dawn. 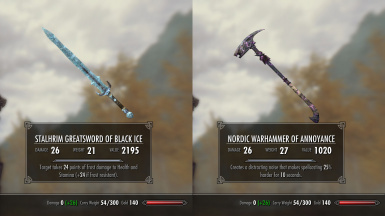 Wintermyst is compatible with mods that rebalance or change enchantments if loaded after Wintermyst. 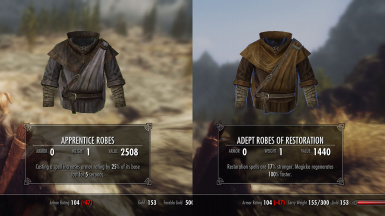 Wintermyst is compatible with mods that add items to specific vendors. Wintermyst is compatible with mods that change enchantment shaders if loaded after Wintermyst. Repurposes many unused SkillAdvance actor values and will conflict with other mods that do the same.